Why Choose the Student Affairs in Higher Education - Administration Program? The Student Affairs in Higher Education (SAHE) program provides education for individuals interested in professional careers in student affairs. The emphasis of this program is on the administrative perspective of student services and supports student development. The Student Affairs in Higher Education program offers graduate students opportunities for involvement in a variety of areas while they are pursuing their master's degree. Practicum, internships, and graduate assistantships are designed to complement the academic course work and provide opportunities for practical application. Assistantships are not required but highly recommended for students to pursue. Graduate students in our program represent gender and racial diversity, geographical spread, and a significant number of different undergraduate academic disciplines. Candidates have been active in student government, residential services, Greek life, and campus recreation, and others have worked full time in various campus offices. Demand for graduates of the Student Affairs in Higher Education program has been strong. Lindsey Steller and Kate Bumhoffer won the OCPA Case Study Competition in January 2016. Watch a video of their presentation to check out how impressive these two first year SAHE students are! View the SAHE Newsletter (PDF) to see what our students are doing. The Career and Advising focus consists of three courses dedicated to increasing the helping skills competence of students pursuing the Master’s Degree in Student Affairs in Higher Education. By pursuing this focus students will develop skills that apply to academic advising and career services work. Students choosing the Career and Advising Focus gain knowledge and skills in the delivery of supportive and directive services to individuals and groups. In this focus students enhance their competencies as professional helpers and refine their capabilities to guide students, supervisees, and colleagues. The International focus consists of three courses dedicated to increasing the international competence of students pursuing the Master’s Degree in Student Affairs in Higher Education. By pursuing this focus students will develop skills in the delivery of international student services, along with foundational knowledge and skills in study abroad practice and research. Students choosing the International focus will conclude their study by participating in a third internship experience in a Student Affairs division abroad. Students pursuing the International focus gain global competencies by developing enhanced understandings of the world and respect for the uniqueness of social context. The Sport Management focus consists of five courses dedicated to increasing knowledge and skills related to managing sports programs at the higher education level. By pursuing this focus students will learn about the business aspects of sports and recreation. The curriculum exposes students to a wealth of issues including the role of athletics in higher education, sport and event marketing, current issues in American sports, finance, and law. When students choose this focus, they can earn a Sport Management Certificate in addition to their master’s degree. Students with an interest in a specialized focus area other than those offered may identify nine credit hours of graduate coursework related to an area of interest as a personal independent focus area. The student would then discuss with their faculty adviser how this interest area and the courses selected are compatible with their career goals. Upon approval of the faculty adviser, this independent focus may be pursued. The following areas are provided as examples only and not meant to be all-inclusive: women's studies, non-profit administration, and management. NOTE: Test requirement is waived if the applicant has a cumulative undergraduate GPA (from all schools attended) of 3.0 or higher or if the applicant has a previous master's degree. Admission is in Fall Semesters. Annual Application Deadline: Although December 1st is the first consideration application deadline, at this time, we continue to accept applications for the Fall 2019 cohort. NOTE: Although students can submit application materials later than the annual December 1 deadline, students must reapply for the next academic year once the cohort for the upcoming year is full. Successfully complete an interview, held annually in January and February, with program faculty. NOTE: Attendance at these events is required for all newly admitted students. A biannual study abroad trip is available for Student Affairs in Higher Education students and others who desire to learn more about global diversity in higher education. 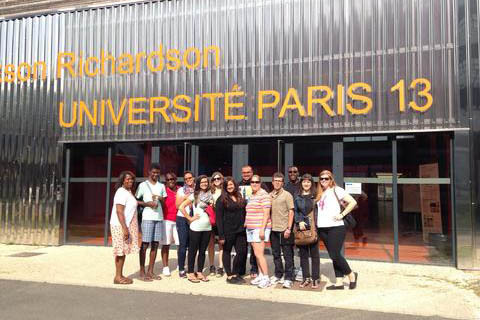 During June 2014, nine students traveled to Paris with Professor Dr. Carol Logan Patitu to visit universities, museums, and other locations of cultural interest. A second trip is planned for Summer 2016. Those interested in this opportunity should contact Dr. Patitu at carol.patitu@wright.edu to learn more. 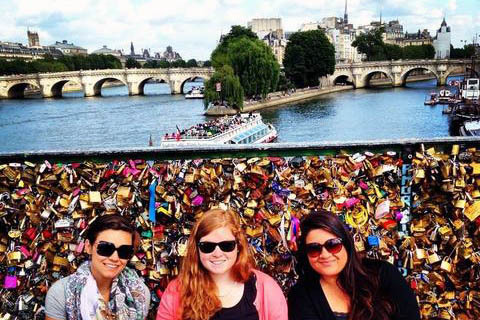 Participating in the study abroad experience also requires enrollment in a three credit hour course (Global Diversity in Higher Education in France) that includes lectures, discussions, written assignments, and activities. The course meetings also help prepare students for the details surrounding travel outside of the U.S.
Come travel with us and learn! 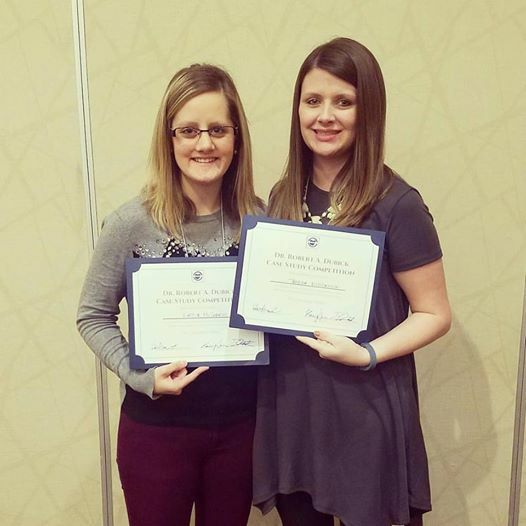 Congratulations to second-year SAHE students Katie McGrath and Taylor Ridenour for competing in and winning the Dr. Robert A. Dubick Case Study Competition at the 2017 OCPA (Ohio College Personnel Association) Annual Conference, held in Worthington from January 25-27. McGrath and Ridenour competed against six other teams from programs across the state. Their multifaceted case involved responding to a student questioning her identity, a critical roommate, a hostile mother, and a concerned advancement professional. Each of them received a certificate and $350. Kudos! The Wright State University graduate program in Student Affairs in Higher Education (SAHE) began in 1983 as a concentration in the Counselor Education program in the College of Education and Human Services. In 1995-1996, the program moved to the Department of Educational Leadership (currently the Department of Leadership Studies in Education and Organizations). A program review conducted in 1999-2000 recommended that the SAHE graduate program be discontinued due to low enrollment, and a moratorium was placed on admission. The Vice President for Student Affairs, Dr. Dan Abrahamowicz, thought there was a need for the program, and he and the Dean of the College of Education and Human Services, Dr. Greg Bernhart, agreed that if an adequate number of students could be recruited, the SAHE program would continue. They jointly funded a half-time faculty position and set a goal of 15-20 graduate students within two years. Dr. Joanne Risacher, a previous student affairs administrator at WSU, was completing her Ph.D. in Higher Education Administration and was recruited for the half-time position beginning in September 2001. The enrollment goal was easily met and interest in admission continued to grow. Today's enrollment in the two-year graduate program stands at 45-50 students. In order to provide an optimal learning experience with relatively small class size and to assure a high percentage of graduate job placements, the number of new students per academic year is capped at 20-22. For the past seven years, there has been a waiting list for admission. There have been four SAHE program directors: Dr. Wilma Henry, while the program was housed in Counselor Education; Dr. Charles Ryan, when the program moved to Educational Leadership; Dr. Joanne Risacher, and the current program director, Dr. Carol Patitu.